John Boyega has had a big few years. First, the relatively unknown British actor made headlines when he was cast as Finn in Star Wars: The Force Awakens , and then went on to stir up major controversy after it was revealed that he plays a — gasp — black stormtrooper in the movie. Needless to say, Boyega has been the subject of more than his fair share of headlines, and the film hasn't even been released in theaters! 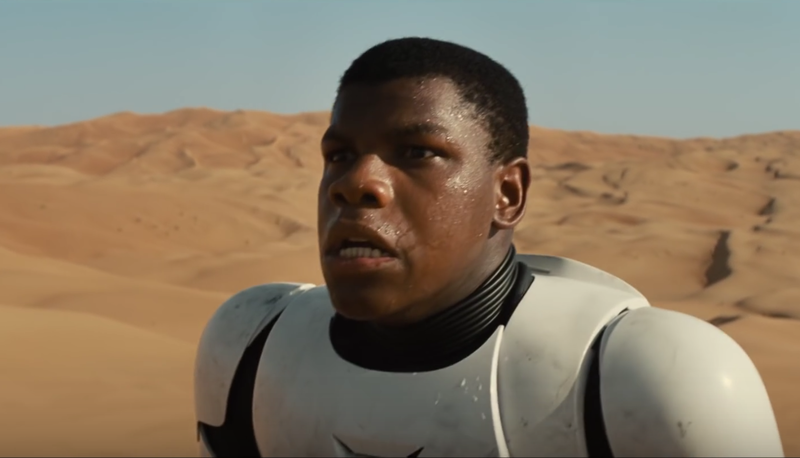 The Force Awakens has already made a star out of Boyega, but his future with the franchise remains clouded in mystery. So, how many Star Wars movies did John Boyega sign onto? Unfortunately, Boyega's contract details have not been publicized or confirmed, but it's probably safe to assume he signed on to star in more than one Star Wars film. After all, Hollywood just doesn't work in stand-alone movies anymore — it's all about the sequels. Not to mention the fact that the original Star Wars trilogy, as well as the prequel trilogy, all followed three main characters throughout the films. It would be strange and off-putting to many Star Wars fans if Boyega's character didn't live to see the rest of this new trilogy. Boyega has been careful to avoid saying anything definitive about his future in the franchise. During a recent interview with "Sway in the Morning," when asked point blank if he was signed on for multiple Star Wars films, Boyega responded, "I'm in limbo right now. ...Star Wars has been away for so long, there's so much concentration on releasing this movie. And this movie is the be all and end all of everything." Pretty much you're standard non-answer. Putting Boyega's cryptic answer aside, there's also the fact that Lucasfilm president Kathleen Kennedy all but confirmed Boyega's return in Episode VIII at a recent press conference. Speaking about the planned Force Awakens sequel, tentatively titled Episode VIII, Kennedy revealed that she had spoken about the future of the new characters with Episode VIII director Rian Johnson, adding, "These guys are getting ready to head over in January." As she spoke, Kennedy reportedly gestured towards Boyega, Oscar Isaac, and Gwendoline Christie, suggesting that at least two of them will return for the planned sequel. There's also the whole lightsaber thing — you know, the fact that Boyega is seen wielding one in the trailer for The Force Awakens? The lightsaber is one of the most iconic pieces of Star Wars history, so seeing Boyega's Finn fighting with one suggests Finn is not only crucial to the first film, but to the entire rebellion against Kylo Ren. And, in case that's not enough to convince you that Boyega will be sticking around for a few more Star Wars films, consider what Boyega told The Hollywood Reporter about being cast in the film: "J.J. Abrams sat me down and said, 'You're the new star of Star Wars .'" Not to read too much into it, but that's a pretty bold statement to make about a character who might not be around for more than one movie, but not about the new star of a trilogy.